All Eagle Point Vlg-Riverchas homes currently listed for sale in Coppell as of 04/20/2019 are shown below. You can change the search criteria at any time by pressing the 'Change Search' button below. 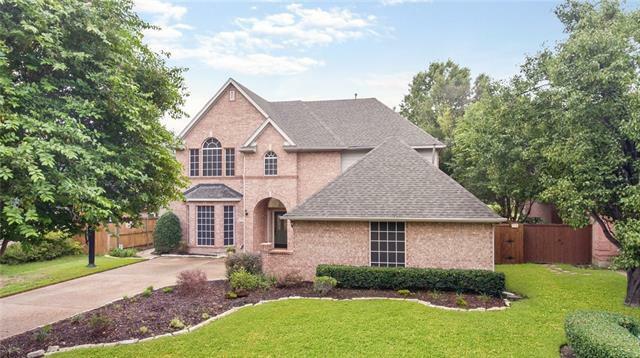 "Beautifully maintained David Weekly home on a golf course lot in the highly sought after Riverchase neighborhood in Coppell. Great elementary school and open enrollment to Coppell ISD. Magnificient views of fairway and lake from the living room and kitchen. Beautiful garden backyard that offers the best view of the golf course. 15 mins to DFW Airport, 30 mins to Dallas downtown. Major shopping, YMCA, community pool, parks & kid's facilities conveniently close. Roof has been replaced on 2018 and "